Any border crossing located in the middle of the mountains at 4360m is going to be an experience in itself. 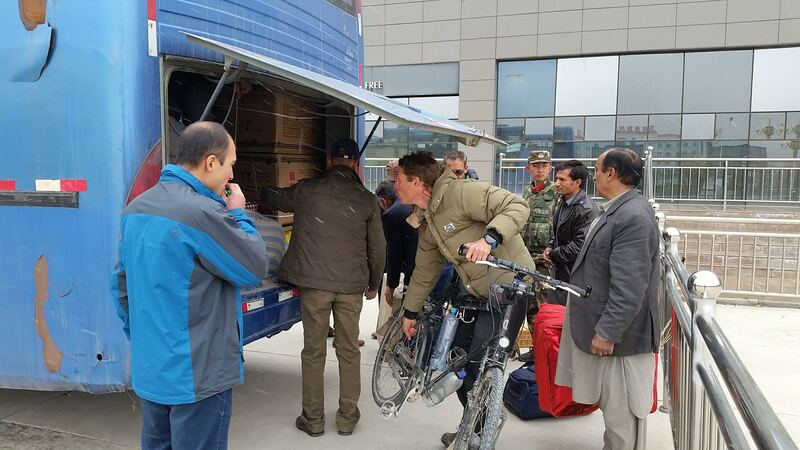 Tajikistan stamped us out and we rode frozen-toed into no-man’s land, stopping at the Chinese gate. After 5 minutes of waiting we were allowed through and told to go into waiting room number 1 where our passports were checked. Shortly after we were ushered into room 2 for a full body scan, after which we were taken to room 3 for a full bag scan and bag search. We’d been warned that the Chinese authorities may take knives off you so we’d hidden these on the bikes. No problems found which was a relief. We waited in room 3 for a while, not knowing why or what we were waiting for, joined by two Tajik and Harry and Seb (the two other Brits we’d been recently cycling with). Eventually a guard came along and told us to take our phones back into room 1. 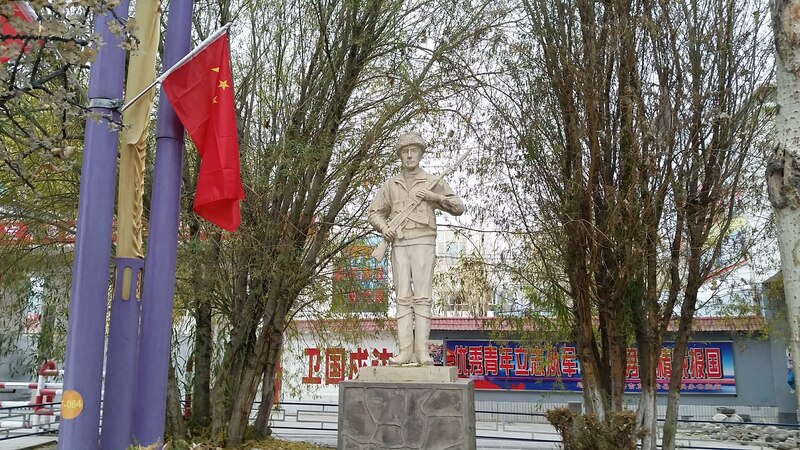 I’d heard reports from others that the police here in Xinjiang, an autonomous territory in western China, have installed spyware on tourists’ phones, and was quite frankly outraged that this could be possible. They took Harry’s phone first and plugged it into a mobile scanning device, meanwhile requesting to see everyone else’s phones and proceeding to watch our videos, look at our files and searching for any ‘unsolicited material’, whatever that may mean. Luckily for us the scanning device appeared to break down before they could plug our phones in. Finally we were told we could leave, but not cycle!! We were loaded into a truck that careered down a beautifully smooth road to the customs building 14km down the hill, and dropped off in waiting room number 4. Another unknown wait, followed by another bag scan and finally 4 hours later our passports were stamped and we sped off down towards Tashkurgan hoping to make it before dark. 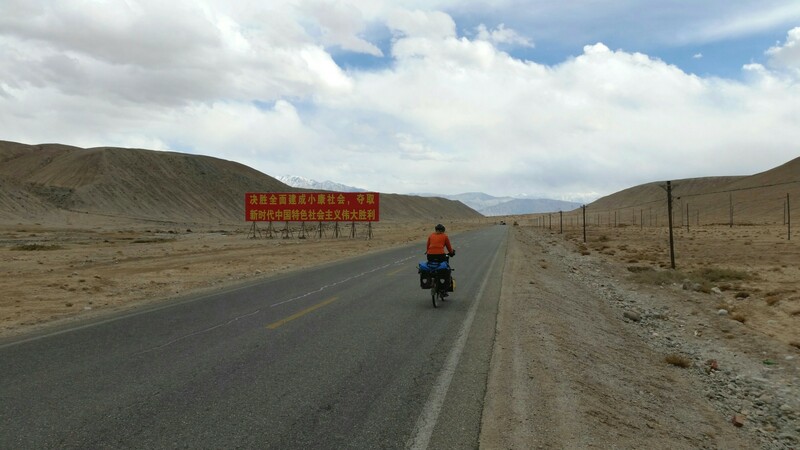 We left customs at 4pm and had 60km to ride but despite the fact that Xinjiang is thousands of kilometres West of Beijing, they have to operate on Beijing time, so we knew it wouldn’t get dark until at least 8pm. You can’t fault the Chinese roads for being in perfect condition. Although there is something quite unsettling about passing quite so many cctv cameras in the middle of nowhere, and realising that every town is fenced off from the road, indeed from the outside world by barbed wire. 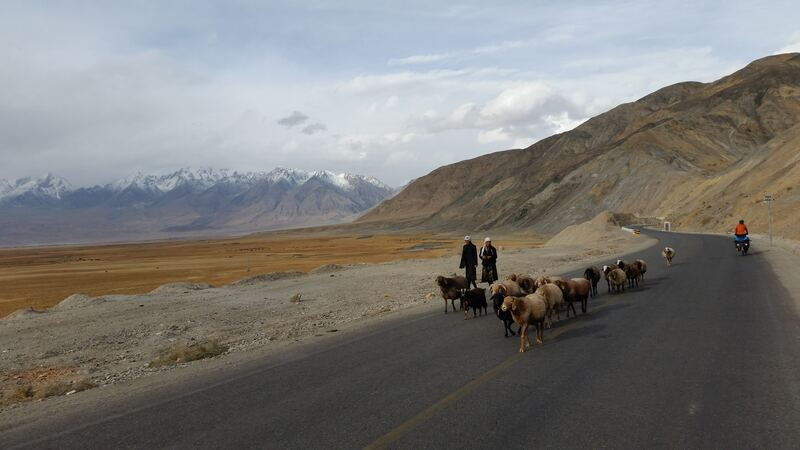 This region has come under scrutiny by human rights organisations for China’s apparent use of internment camps to ‘re-educate’ the local Uighur Muslims - see this news article for more info on this. From what we saw, sadly the stories appear true. 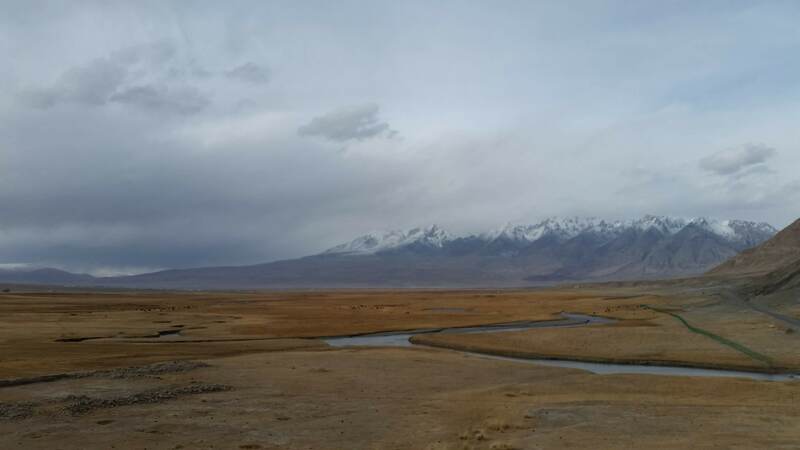 We rode down through the Tagharma plateau wetland where bus loads of Beijing tourists were snapping away, at us as much as at the landscape, arriving in Tashkurgan at nightfall. Exhausted we attempted to stay at the K2 International Youth Hostel, the only place recommended on the few blogs we’d read. It turns out this is for good reason as no other hotel in town accepts foreigners as we found out after the hostel said they were full. With all options exhausted we pleaded back at the hostel where the nice security guard rang a friend and said we could stay at the Europa Gardens Hotel. Except, after negotiating a cheap room price we were soon told that the room was suddenly booked and we couldn’t stay! We could however stay in their business lounge, a sort of airport lounge room with 100 lounge chairs which noisily filled up as the night progressed. Ear-plugs in, by this point we were too tired to care, too tired even for food and finally fell asleep. The next challenge - getting a bus ticket to Sost, Pakistan. 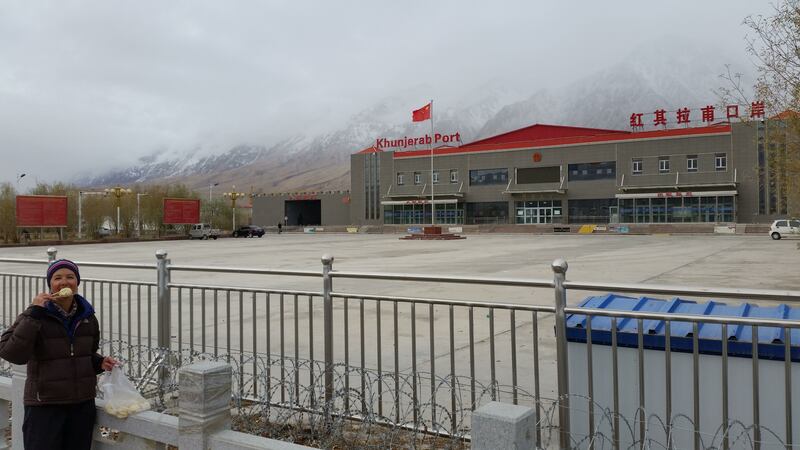 The border may be 120kms from the town but Chinese customs are in Tashkurgan therefore you MUST get on their bus to leave. We were told to buy tickets from the bus station at 10 o’clock and that thebus would leave midday at the Customs house, a few kilometres out of town. We got to the bus station early and waited after reconfirming we could buy tickets at 10. Then, at 10, we were told to come back at 11! Exasperated we cyled around the block and at 10:15 they finally let us buy tickets!! Customs check out is almost as rigorous as checking in. It was another few hours before eventually we boarded the bus (a strange sleeper bus arrangement) with our bikes in the back and lots of amused, smiling Pakistani men. The bus eventually left at 1:30pm driving past several ‘prohibited zone for immigration vehicles only’ and endless lines of barbed wire fences until reaching a snowy, blustery pass. Formality checks only, too cold and snowy for photos anyway, but boy were we pleased to have crossed the border line. We had expected some difficulties with the police in Xinjiang, but had not expected so much trouble finding accommodation. It was the first time all trip we really felt unwelcome anywhere. I would love to revisit China, but right now, we’re pretty happy to have left.